“Jets” from particle collisions are collimated sprays of particles that result from high-energy quarks and gluons, the elementary constituents of nuclei. Particle collisions at the Large Hadron Collider (LHC) produce copious amounts of high-energy quarks and gluons, making jets ubiquitous at the LHC experiments, including CMS. Jets have a rich structure that can be exploited to search for new particles and forces and to understand the strong interaction force in greater detail. 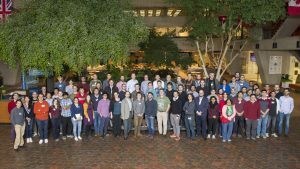 From Nov. 14-16, about 100 collider physicists from around the world met at Fermilab to discuss innovative ways to apply machine learning to jet physics. Modern machine learning algorithms have sparked widespread interest among particle physicists because of their ability to extract useful information from highly complex data sets. The jet physics community has been active in adapting and developing machine learning techniques with connections to computer vision, natural language processing and many other areas. The first workshop on this topic, titled “Machine Learning for Jet Physics,” was held at Lawrence Berkeley National Laboratory in December 2017. Reflecting the rapid pace of development in this area, the participation at the Fermilab workshop saw the number of attendees double. The radiation pattern inside jets can be represented as a grayscale image, where the pixel intensity is the deposited energy. 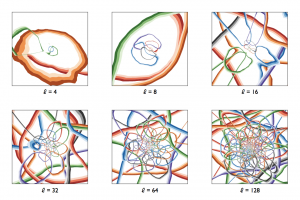 Patrick Komiske and collaborators Eric Metodeiv and Jesse Thaler (MIT) have used a new deep learning technique to find the optimal pixel size and shape for representing a jet. 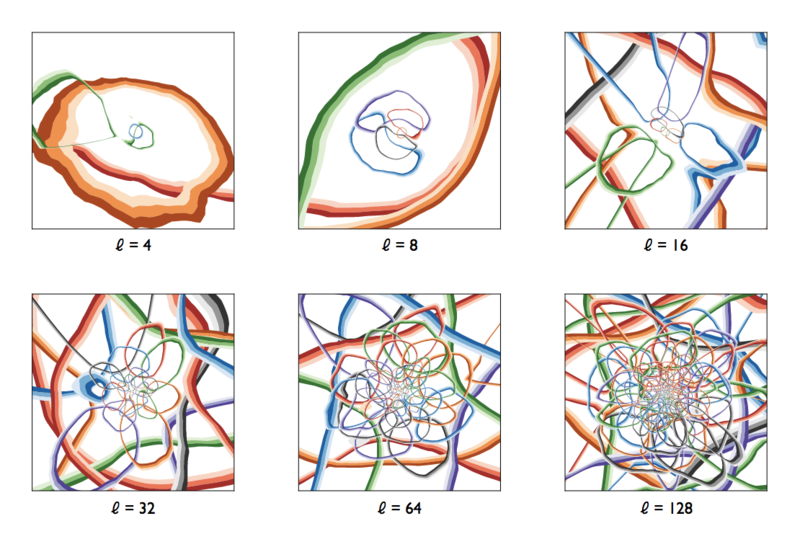 Interestingly, the algorithm has learned that the optimal pixels are a series of blobs that are smaller near the center of the jet. The relationship between blob size and location in the jet is in agreement with predictions from the strong nuclear force. The workshop included multiple sessions targeting new and innovative applications of machine learning for jet physics. One such application is jet tagging, where machine learning algorithms can be used to identify different types of jets. The ATLAS and CMS collaborations presented their latest machine-learning-based jet tagging algorithms, which significantly improve upon traditional approaches. A second session focused on different ways of representing jets: images, sequences, trees or sets for optimal use of machine learning algorithms. A wide range of practical aspects, including from detector calibrations and real-time machine learning implementations on field programmable gate arrays (FPGAs) in LHC triggers were covered in other sessions. There were discussions of semi- and unsupervised machine learning techniques, such as autoencoders, to use jets to learn properties of nature directly from data with little or no model bias. An exciting application of these techniques is to perform a model agnostic search for new particles and forces at the LHC. The final day of the workshop featured a brief overview talk by Pushpa Bhat of Fermilab on the historical development of machine learning and its successful use in particle physics at the Tevatron. The workshop program overall highlighted a broad interest in machine learning techniques in particle physics and resonates with ongoing initiatives in machine learning at Fermilab in the energy, intensity and cosmic frontiers. The LHC Physics Center (LPC) plays an important role in this research area and co-hosted this workshop. We were honored to serve as workshop chairs. Two public events were also featured during the workshop: a colloquium titled “Covariant Neural Network Architectures for Learning Physics” by Risi Condor of the University of Chicago on Wednesday, Nov. 14, and a Wine and Cheese Seminar titled “Deep Learning for the Future of High-Energy Physics” on Friday, Nov. 16, given by Sergei Gleyzer. Additional information about the workshop can be found at the event’s website. Many thanks go to the workshop Organizing Committee, Local Organizing Committee, LPC Event Committee, and LPC chairs for the successful event. Sergei Gleyzer is a physicist at the University of Florida and Fermilab and a member of the LHC Physics Center. Ben Nachman is a physicist at Lawrence Berkeley National Laboratory.